Born and brought up in the Democratic Rep of Congo (D.R.C. 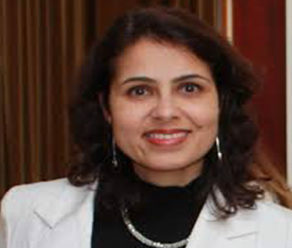 ), Nina Noorali has spent 17 years moving to different countries pursuing her career as a life insurance actuary. Not long into that field did she feel the call for more human values and deeper meaning to her life. After taking few sabbaticals to do volunteer work in India, she became a yoga teacher in 2008 and an IAHV trainer in 2009, actively working in South Africa right after her graduation. She focused her efforts on prison rehabilitation programs as well as working in townships to bring joy and stress release to child earners. She initiated stress release workshops in the D.R.C. between 2009 and 2010, reaching out to different sectors of society and mainly NGO workers, including the UN, who were overwhelmed by the political upheaval and difficult environment. Nina is in charge of program development within IAHV Peacebuilding as well as the director for IAHV Belgium, focusing on CVE and trauma relief programs. She is based out of Brussels.